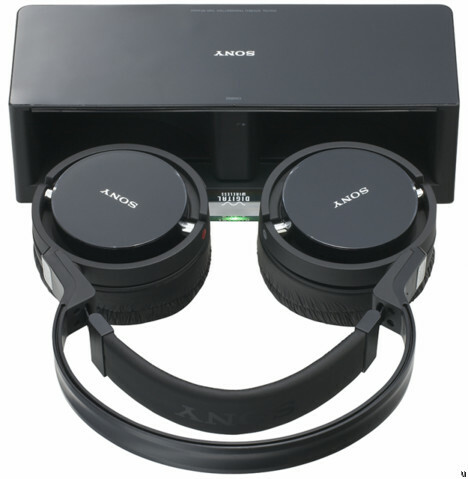 Our guest blogger Gary Kemp puts Sony’s latest wireless headphones through their paces. Before I start the review proper, a confession: I have never seen the point of cordless headphones. From my point of view – I call it ‘traditional’, although others might call it ‘stuck in the past’ – your music of choice is best heard through a decent pair of speakers. Headphones are for when you want to take said music with you, or when you’re in some kind of studio. Thanks to Sony’s MDR-RF4000K wireless headphones, I’m a changed man. Well, at least when it comes to headphones. I used to have a very old pair of Sony hi-fi headphones, which accompanied me to college every day. I loved the sound quality, but not the way they weighed my entire head down, or the two metre long cable that tried its best to loop itself around my feet at every opportunity. Thankfully, Sony appear to have worked hard at both of these niggles. These over-ear style headphones are much lighter (at just 300g) than their size would suggest, and sit comfortably thanks to a self-adjusting strap that cleverly doubles as an on-off switch. One earpiece has a discreet volume control, and the other one houses the (included) NiMH battery and charging connector. Charging is a doddle – the headphones slip snugly into a neat, but necessarily large docking station – but listening whilst charging is not possible as a result. The docking station contains 3.5mm stereo and RCA connectors for hooking up to your audio device, and the cables required to receive sound and power. Sony claims a 30-metre range for these headphones, but I suspect this may only be possible under laboratory conditions. During my highly technical, intensive testing – which involved pacing up and down the garden with the patio doors shut – the reception dropped off noticeably at about 10 metres, and got progressively worse any further out than that. That said, if you aren’t pacing up and down your garden that far away, the sound quality alone justifies the price. Bass notes are satisfyingly thumpy, and trebles ring out clearly – after living with iPhone earphones, the clarity is startling. The stereo separation is wide enough that you can almost close your eyes and feel like you’re in the middle of a studio with the band around you. Because they cover your whole ear, very little sound gets in from outside, and vice versa – it is possible to listen to music at quite high volume before it becomes audible to someone else, even if they are sitting next to you. As a result, they become ideal for listening to music when someone else wants to do something else, or – in my case – when your wife doesn’t fully appreciate the intricate harmonies of a popular Liverpudlian beat combo. Thanks to the standard connectors, this can extend to bed-bound TV watching, or even a little late-night guitar practice. These headphones are perfect for the person who wants to hear their music as it was meant to be heard, but without having to stay within two metres of their stereo/computer/TV/amp (delete as applicable) or disturb others. Much as I may have been converted to the wireless crowd, there are a couple of flaws which stop me from giving these ‘phones a perfect 10. For starters, they have to be placed back into the docking station in a very specific way to start charging – on several occasions I docked them, only to have to re-position them a few times before the charging indicator lit. If you’re not careful, you could end up with unexpectedly dead headphones. Secondly, the sound can break up and distort if you accidentally set the volume too high on the device you are playing from – perhaps a noise limiter is in order for any future versions. Apart from that, they really are hard to fault – an easy 9/10 from me. Previous Previous post: Lady Geek TV #6 – Can a shopping app change your life?